Normally placid Switzerland has been caught up in uncharacteristic intrigue since the government announced that it secretly destroyed highly technical blueprints for producing nuclear weapons. At a press conference on May 23, President Pascal Couchepin said the documents had been shredded to prevent them from falling into terrorists' hands. "The information contained in these papers presented a considerable risk to the security of Switzerland and the international community as a whole," he said. But that explanation has only enlivened controversy over who ultimately ordered the shredding, and to what end. "There are more questions about this affair than there are answers," says Ken Egli, an editor at the International Relations and Security Network (ISN) at the Swiss Federal Institute of Technology in Zurich. In 2004 Swiss authorities, acting on a tip from the International Atomic Energy Agency (IAEA), arrested engineer Friedrich Tinner and his sons Marco and Urs on the suspicion of helping to supply gas centrifuge parts for use in Libya's now abandoned nuclear weapons program. They allegedly acted between 2001 and 2003 through the trafficking ring operated by Abdul Qadeer Khan, the father of Pakistan's atom bomb. Khan, under house arrest in Pakistan, last week claimed he'd been coerced into his 2004 confession to helping Libya, North Korea and Iran with nuclear weapons. The tens of thousands of pages of blueprints and technical information, reportedly secured on Urs Tinner's property, were to be used as evidence against the Tinners, who are still incarcerated pending further investigation. Swiss authorities said the documents were shredded under IAEA's supervision on November 14, 2007. Contacted by TIME, IAEA's spokesperson refused to comment on its role or involvement in the affair. Couchepin too declined to answer further questions. The official stonewalling has fueled speculation that the United States, and specifically the CIA, has pressured the Swiss government to destroy the documents to aid its own efforts to stop nuclear smuggling, whatever the effect on the Tinners' trials. "The decision to destroy evidence related to an ongoing investigation is highly unusual and has raised questions over the possibility of CIA involvement," Egli says, pointing out that during his press conference Couchepin conceded that the Swiss government had also blocked an investigation into charges levelled by the federal attorney that Urs Tinner was engaging in illegal actions for a foreign country. Allegations that Tinner was a CIA agent were made in a book The Nuclear Jihadist by Douglas Frantz and Catherine Collins, as well as by the former U.N. weapons inspector David Albright. "What strikes me as interesting is what international connections did Tinner have, and if he really was a CIA agent, what impact did this have on the government's decision to shred the documents?" Egli adds. Although no tangible proof has surfaced of U.S. involvement, the mere implication that a foreign power might have interfered in Swiss affairs is generating outrage in some political circles. The Green Party has called for an immediate parliamentary investigation of the allegations, saying, "The explanation given by Mr. Couchepin is not very convincing." Others have expressed concern over the way the Federal Council  Switzerland's executive government  has unilaterally handled this matter, bypassing the courts and parliament. "If the government wanted to act on behalf of the U.S, it needed to maintain as much secrecy as possible in case those documents really were a threat to the security of the state," says Thomas Fleiner, director of the Federalism Institute at Fribourg University. "But such an evaluation should have been done by the court and not by the executive branch." The government's secretive maneuver has also raised concerns at the Administrative Commission that oversees the Federal Council's activities pertaining to state security and intelligence services. "We want to know the reason and the legal basis," says commission president Bruno Fasel, adding that his group was kept in the dark about the shredding. The commission has launched its own investigation, with the findings to be released in the fall. As the scandal plays out mostly in the media and the political arena, the Swiss public remains largely unmoved. 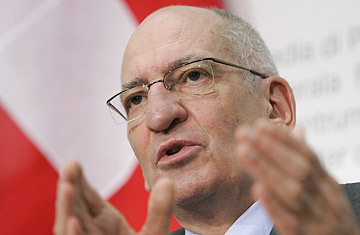 "In general, Swiss people trust their government and hold it in high regard," says Egli. "The feeling is that if the government destroyed the documents, they surely had valid reasons to do so. It really doesn't affect their lives one way or another."